CTVR is headquarted in Trinity College Dublin (TCD). The National University of Ireland, Maynooth (NUIM), Dublin Institute of Technology (DIT), Dublin City University (DCU), Tyndall National Institute, University College Cork (UCC) and the University of Limerick (UL) are all involved. The Management Committee of Director, Deputy Director and Co-Principle Investigators (PIs) is drawn from across the CTVR institutions. This team is responsible for the research direction of CTVR, the key interactions with industry and the long-term strategic vision. Supporting the Management Committee, the Operations Management Team based in Trinity is responsible for general and financial management, business development, industry liaison and education & outreach. The Core research team is a wide group of expert researchers that carry out projects in the wireless and optical domains. Professional researchers are complemented by a strong group of graduate students (Ph.D. and M.Sc.) working alongside them. 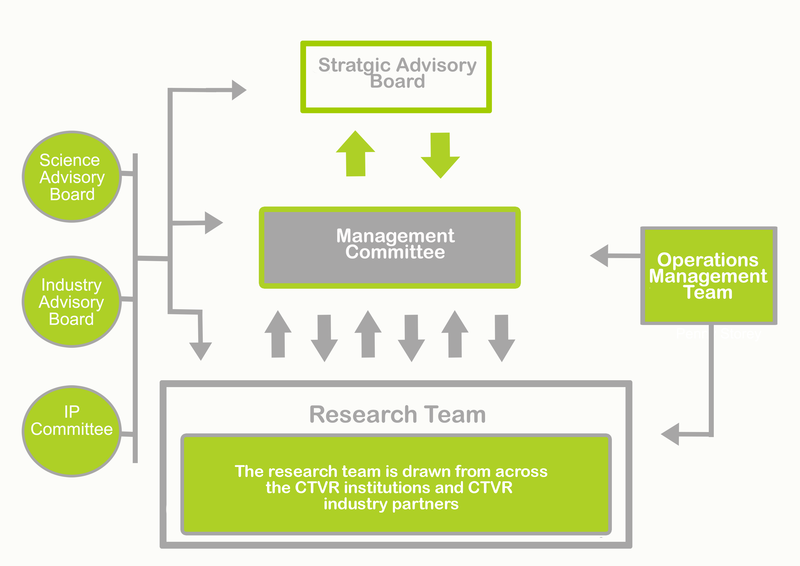 The CTVR Industry Partners participate in the development of the research programme by highlighting the industry-relevance of the problems addressed by the researchers. CTVR has a Board which has oversight of all CTVR activities and ensures that best practice is followed. The international Scientific Advisory Panel ensures that the problems addressed are sufficiently challenging academically. The Industry Advisory Panel, with a representative from each industry partner, ensures that the programme of research is relevant and robust.